We manufacture quality range of Ash Handling Pipe Bend as per the client's demands. Here, the use of Alumina Ceramic in Ash Handling systems help in lowering the possibility of wear and damages caused to the internals. Further, other than this, we also offer wear resistant Ni-Hard castings that are used for checking the wear possibility. These Bends are manufactured by our experts using high quality raw material and advance technology in order to follow the set industry norms. We have gained recognition as an eminent enterprise, devotedly engaged in offering a broad range of Ash Handling Equipment. Backed by a team of experts, it is manufactured using best quality raw material and cutting-edge technology. Our offered system is precisely designed, in order to meet the industry standards. In addition, this system is availed in different specifications, as per the varied requirements of our valuable clients. Our range is strictly tested on different parameters to assure it on counts of quality. A hopper is a large, pyramidal shaped container used in industrial processes to hold particulate matter that has been collected from expelled air. Hoppers are usually installed in groups to allow for a greater collection quantity. They are employed in industrial processes that use air pollution control devices such as dust collector,electrostatic precipitators and baghouses/fabric filters. Dust enters the hopper from the collection device. For example, baghouses are shaken or blown with compressed air to release caked-on dust from the bag. 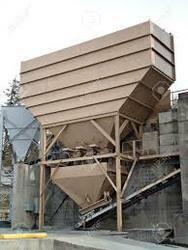 Precipitators use a rapping system to release the dirt. The crumbling dust falls into the hopper. Once the dust in the hopper reaches capacity, it is released through an opening in the bottom with a diameter of about 8–12 inches (20–30 cm). Hoppers are rectangular in cross section but have sides that slope at about a 60° angle. Slanted sides make it easier to remove the ash. Conveyors are sometimes used to carry away the particulate matter. 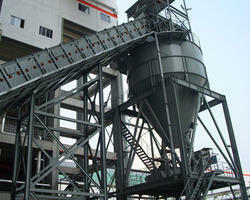 We are a renowned organization, which is engaged in offering Ash Handling Plant to our clients. 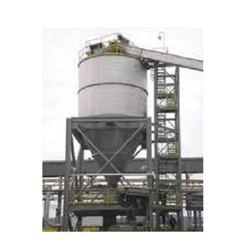 The offered range of ash handling plants is available in customized specifications to append and respond to the diverse demands of respectable clients. Looking for Ash Handling System ?